Ronit Muszkatblit, Artistic Director LABA, on this year’s LABA fellows. Welcome to a new year of LABA. A new year of ancient questions. A new year of investigating the two given things we all have in common: Life and Death. From the moment we come into being until the moment we are no more, we wrestle with our existence in this realm and beyond. 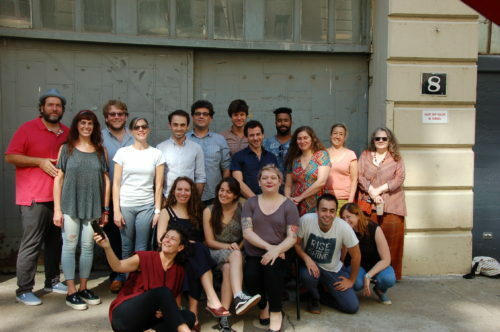 We’re looking forward to studying texts and seeing new work from our 2018-19 LABA fellows: Dmitri Barcomi, Ari Brand, Maya Ciarrocchi, Jessica Tamar Deutsch, Yochai Greenfeld, Yonatan Gutfeld, Jeanne Heifetz, Marques Hollie, Stav Palti-Negev, Richard Saudek, Ilana Sichel, Mariano Wainsztein, and Alex Weiser. They are all inspiring artists, thinkers, and creators of Jewish culture: their new works at LABA will expand our notions of life and death; they will give us at least fourteen new keys to that door. On this day after Yom Kippur, when traditionally we believe that we have been relegated to the Book of Life or the Book of Death, I am honored to share the world with the best tour guides that I know of.